The new flagship of the Kettler elliptical cross trainers is the premium frontwheeler Skylon 10. The development of the approved Skylon series includes a new design, a new console, and new detail solutions, among other things. 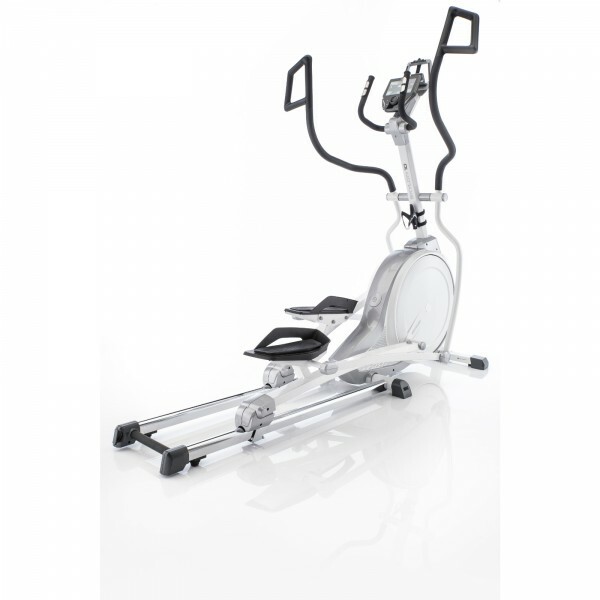 Two user modes make the Skylon 10 an elliptical cross trainer with real functions of an exercise bike. The high-quality training computer combines functionality and interactive training and the balance mass system of 22 kg guarantees an ergonomic training. The new Kettler Premium display includes all advantages of the Advanced console, however it still offers some more features. Find your personal coach in the IPN Coaching mode of the Premium display. After a stress test, the coach function compiles 24 customised training programmes, which you can do as user. The effects will be amazing. The IPN concept was developed by experts of the institute for prevention and aftercare in Cologne. The HIT-Training (High Intensity Training) has been developed for users, who only have little time for regular training sessions. Two HIT sessions a week reduce significantly the risk to suffer from diabetes, heart attack or strokes. The Premium display includes directly this function. Via a Bluetooth interface, you can connect the Skylon 10 with KETTMaps or with Kettler World Tours 2.0. Via this connection, you can cycle interactively tours all over the world using your tablet or smartphone and experience directly all descents. The machine adjusts regularly the resistance and gives you the feeling of really cycling on the road outdoors. The Skylon 10 and its 22 kg balance mass system offer a joint-gentle and ergonomic training thanks to its flat, elliptical training movement. The space (Q factor) of 10 cm is small and protects the joints thanks to avoiding a knock knees position. The joints of the machine are equipped with high-quality, double ball bearings and increase distinctively the lifespan. The treads are equipped with foam rubber, a comfortable running is hence easily possible and offers a high comfort, in addition. The ergonomic ends of the handles offer some grip versions and a comfortable training position for every user. Kettler elliptical cross trainer Skylon 10 add to comparison list.